Production of the Chevrolet Equinox, GM's top-selling crossover in the U.S. and Canada, stopped Sept. 17 at the CAMI plant, which employs about 2,750 people. Unifor leadership described a Thursday meeting with General Motors in Detroit as “constructive” following the latest efforts to end an 11-day strike at an Ontario plant that assembles the Chevrolet Equinox. Unifor Local 88 President Dan Borthwick said the union laid out a proposal to high-level GM officials at the meeting. He said Local 88, which represents the workers at CAMI Assembly in Ingersoll, Ont., expects a response from GM by late Friday. “Hopefully, we can get back to the table,” Borthwick told Automotive News Canada in a phone interview. Should GM respond positively to Unifor’s offer, Borthwick said the two sides could sort out a deal within three days. Whether GM does so is a major question. The two sides have failed to see eye-to-eye on the plant’s status as a producer of the Equinox, GM’s top-selling crossover and one of its most profitable models. Unifor has demanded GM name CAMI as the lead producer for the Equinox, a move union leaders say would protect Canadian jobs from being outsourced to Mexico. Job security has been a top priority for Unifor thanks in large part to GM’s shift this year of GMC Terrain production from CAMI to Mexico, leading to about 400 workers on layoff and another 200 taking buyouts or early retirement packages. The Equinox is also built at two Mexican assembly plants. The plants have built 40,017 Equinoxes since production began there in April. The CAMI plant, which runs on three shifts six days per week, has built 132,388 Equinoxes since the beginning of the year, according to the Automotive News Data Center. Lead producer status would allow CAMI to become the first plant to receive increased Equinox production should GM need it, and it would be the last plant to have production scaled back. 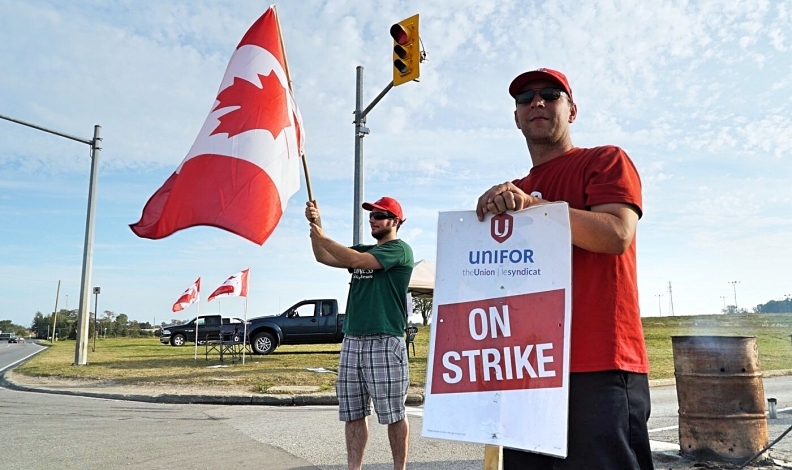 The strike, the first in Canada against an American automaker since 1996, has had wide-ranging effects on the Canadian supply chain. GM, for instance, laid off workers at its St. Catharines, Ont., plant, which supplies transmissions to CAMI, and has scaled back engine production at plants in Flint, Mich., and Spring Hill, Tenn.